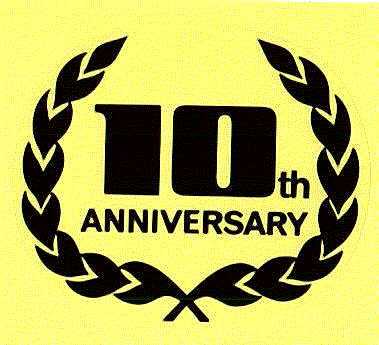 This month, this blog hit 10 years. 10. Stump the Priest: Head Coverings. 9. So Gay Marriage Won't Impose Anything on the Rest of Us? 7. Stump the Priest: Unicorns? 6. Unfortunate Trends in the Roman Catholic Church. 5. The Story of Sgt. MacKenzie. 4. ROCOR and the Assembly of Bishops. 3. Further Thoughts on the Ancient Faith Today Discussion: The Pope and the Patriarch. 2. What should Orthodox Christians do, when there is no parish nearby? 1. Homilies on the Lord's Prayer. And what surprises me is that the number one post has more than 3 times the number of hits that the next most popular post has, and as best as I can tell, this is due almost exclusively to google searches. Question: "Is it necessary for an Orthodox Christian to always wear a Cross?" The practice of wearing a cross is very ancient, and it is done for two reasons: 1). It is a confession of faith that we are Christians; and 2). The Cross is a weapon against evil. In Russia, to say that someone "took off his Cross" is another way of saying that they have renounced their Christian Faith. 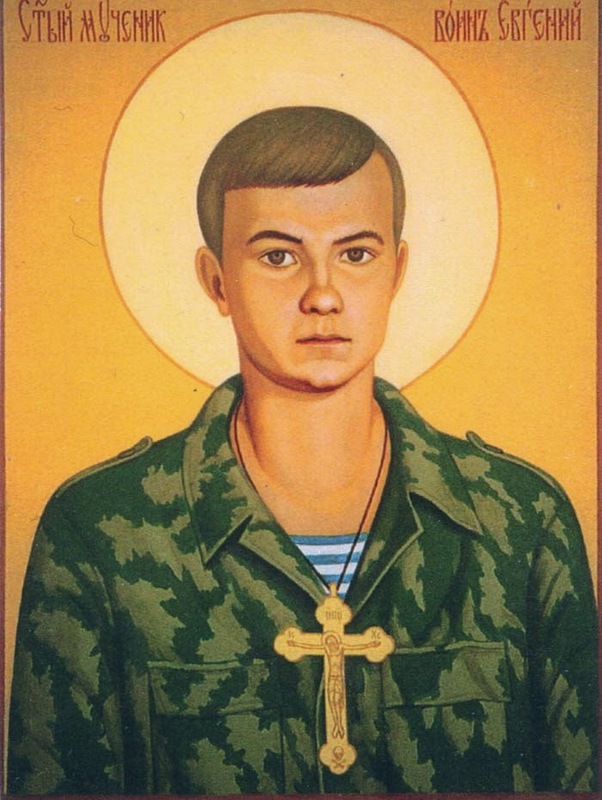 One of the most popularly venerated saints of recent times is the soldier Evgeny Rodionov, who was captured by the Muslim Chechens during the First Chechen. He was beaten and tortured, and finally beheaded because he refused to remove his Cross. There are some good reasons why someone might need to remove their Cross temporarily, perhaps because of some work safety issues, but aside from such exceptional circumstances, one should wear their Cross at all times. For laymen, the wearing of the Cross is worn next to the skin, and so usually is not visible to others, but is a constant reminder to one's self of their faith. However, it can at times be seen by others, and so is also a testimony to others, as it was most clearly in the case of the New Martyr Evgeny. "Let God arise and let His enemies be scattered, and let them that hate Him flee from before His face. As smoke vanisheth, so let them vanish; as wax melteth before the fire, so let the demons perish from the presence of them that love God and who sign themselves with the sign of the Cross and say in gladness: Rejoice, most precious and life-giving Cross of the Lord, for Thou drivest away the demons by the power of our Lord Jesus Christ Who was crucified on thee, Who went down to hades and trampled on the power of the devil, and gave us thee, His precious Cross, for the driving away of every adversary. O most precious and life-giving Cross of the Lord, help me together with the holy Lady Virgin Theotokos, and with all the saints, unto the ages. Amen." This prayer begins with the words of Psalm 67, but go on to interpret that prayer as a prayer against our invisible enemies, the demons, who are defeated by the power of the Cross. Wearing a Cross is not a lucky charm that would be of any benefit to an unbeliever, nor is it a guarantee that even a pious Orthodox Christian will experience no physical harm while wearing it; but for those who do wear it with faith in the power of the Cross of Christ, it is of great spiritual comfort and benefit. Question: "When Jesus was asked how we are to pray, he gave the "Our Father" prayer, and said nothing about the "Jesus Prayer." Some Orthodox writers almost give the impression that a person will not be saved without the Jesus Prayer, but Christ never taught such a thing. Why would God require a mantra from people every conscious moment of their lives? Repetitive prayers (mantras) are a Hindu, Buddhist and Islamic thing. Does not the same practice imply a common source?" "And when Jesus departed thence, two blind men followed him, crying, and saying, Thou son of David, have mercy on us" (Matthew 9:27). "And, behold, a woman of Canaan came out of the same coasts, and cried unto him, saying, Have mercy on me, O Lord, thou son of David; my daughter is grievously vexed with a devil" (Matthew 15:22). "And, behold, two blind men sitting by the way side, when they heard that Jesus passed by, cried out, saying, Have mercy on us, O Lord, thou son of David" (Matthew 20:30). "And as he entered into a certain village, there met him ten men that were lepers, which stood afar off: and they lifted up their voices, and said, Jesus, Master, have mercy on us" (Luke 17:12-13). But in the parable of the Public and the Pharisee, the prayer that the publican says, for which he is commended, is "God be merciful to me a sinner" (Luke 18:13). And so unless one disputes that Christ is God, Christ did teach us to pray a prayer that is substantively similar to the Jesus Prayer. "I will give praise unto the Lord according to His righteousness, and I will chant unto the name of the Lord Most High" (Psalm 7:18). "Some trust in chariots, and some in horses, but we will call upon the name of the Lord our God" (Psalm 19:8). "Blessed is the man, whose hope is in the name of the Lord Psalm" (Psalm 39:5). "Praise the Lord, O ye servants, praise ye the name of the Lord. Blessed be the name of the Lord from henceforth and for evermore. From the rising of the sun unto the going down of the same, the name of the Lord is to be praised" (Psalm 112:1-3). "All the nations compassed me round about, and by the name of the Lord I warded them off. Surrounding me they compassed me, and by the name of the Lord I warded them off. They compassed me about like unto bees around a honeycomb, and they burst into flame like a fire among the thorns, and by the name of the Lord I warded them off" (Psalm 117:10-12). "Praise ye the name of the Lord; O ye servants, praise the Lord" (Psalm 134:1). "The name of the Lord is a strong tower; The righteous run to it and are safe" (Proverbs 18:10). "For whosoever shall call upon the name of the Lord shall be saved" (Roman 10:13). The Power of the Name, by Metropolitan Kallistos (Ware), and On Practicing the Jesus Prayer, by St. Ignaty Brianchaninov. So the content of the Jesus prayer is not only unobjectionable, but it is completely Biblical, in fact it is a summary of the Gospel. "But when ye pray, use not vain repetitions, as the heathen do: for they think that they shall be heard for their much speaking." “And when you pray, do not heap up empty phrases as the Gentiles do, for they think that they will be heard for their many words" (ESV). "And in praying do not heap up empty phrases as the Gentiles do; for they think that they will be heard for their many words" (RSV). "And when you pray, do not keep on babbling like pagans, for they think they will be heard because of their many words" (NIV). "In view is the attempt to manipulate God through repetitive, perhaps even magical phrases, as the verb battalogein, "babble," and the noun polylogia, "much speaking, " suggest. Battalogein, an onomatopoetic word, is probably derived from the cognate noun meaning "stammerer" or "stutterer." The verb here, however, refers not to a speech impediment but to the repetition of meaningless syllables. Polylogia seems to have in mind vain repetition and lengthiness. They "think" (dokousin) they will be heard by means of these devices, but in this they are mistaken" (Donald A. Hagner, Word Biblical Commentary: Matthew 1-13, vol. 33a (Nashville, TN: Thomas Nelson, 1993), 147). "But when ye pray, do not babble as the Gentiles do." "Babbling" means praying foolishly, as when someone asks for such worldly things as fame, wealth, or victory. "Babbling" is also inarticulate, childish speech. Therefore you, O reader, must not pray foolishly, For they think that they shall be heard for their many words. It is not necessary to make long prayers, but rather short and frequent prayers, uttering few words, but persevering in prayer" (The Explanation of the Holy Gospel According to Matthew. Fr. Christopher Stade, Trans. (House Springs, MO: Chrysostom Press, 1992), p. 57). And so what Christ is speaking of are prayers that meaningless... perhaps treated like magical words, which because of their repetition are intended to make God respond in some desired way. But this is not true of the Jesus Prayer. For one thing, the words are not meaningless -- they are filed with deep meaning. And the proper use of the Jesus Prayer requires that one pray it attentively, focusing on the meaning of the words. A prayer is only vain, if you don't mean it, or if you pay no attention to what you are saying, or have no understanding of what you are saying. St. Paul teaches us to "Rejoice always, pray without ceasing, in everything give thanks; for this is the will of God in Christ Jesus for you" (1 Thessalonians 5:16-18). "And who observed and noticed the cause of his groaning? “All my desire is before Thee” (ver. 9). For it is not before men who cannot see the heart, but it is before Thee that all my desire is open! Let your desire be before Him; and “the Father, who seeth in secret, shall reward thee.” For it is thy heart’s desire that is thy prayer; and if thy desire continues uninterrupted, thy prayer continueth also. For not without a meaning did the Apostle say, “Pray without ceasing.” Are we to be “without ceasing” bending the knee, prostrating the body, or lifting up our hands, that he says, “Pray without ceasing”? Or if it is in this sense that we say that we “pray,” this, I believe, we cannot do “without ceasing.” There is another inward kind of prayer without ceasing, which is the desire of the heart" (St. Augustine, Commentary on the Psalms 37:14 (NPNF1 8:106-7). There are those in the Orthodox Church who say that we should have nothing to do with the culture wars that have been raging in our culture since the 60's. They accuse conservative converts of trying to bring those culture wars into the Orthodox Church. Ironically, those who talk like this are usually the very people who actually are bringing the culture wars into the Orthodox Church by their promotion of the acceptance of homosexuality, gay marriage, abortion, women's ordination, and various other liberal causes. It is not as if the Orthodox Church was full of people who thought gay marriage was a great idea until converts started showing up. In fact, the Orthodox in traditionally Orthodox countries are very conservative, and though, for example, there are not lots of Protestant converts to Orthodoxy in Russia, the Russian Church has taken a very strong and vocal position on these issues. "The task of our Churches is to pray and work in order that the Lord would grant His mercy on the peoples of our countries, so that God’s strength would make moral basics stronger, which originate in God’s morals of the Bible, and so that the relations between our countries would strengthen based on common moral values. That is why we heartily wish that the Orthodox Church in America would preserve the fidelity to Christ, His Commandments, and would be, if not very bright and strong, but still light for its people. We are aware that even the light of a small candle becomes a powerful point of reference and helps people find their way to salvation" (see “Orthodox Church is the Bridge that is Able to Unite Russian and American Peoples," translated by Pravmir.ru). This coming right on the heels of a controversy within the OCA, in which a senior priest has suggested that the Church needs to re-think its position on homosexuality, I can't help but suspect that these comments were made in reference to it. 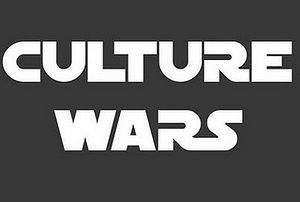 It would be nice if we could ignore the culture wars, but the culture wars are coming after us, our Church, and our families. You can choose what you are prepared to defend, but you cannot choose who will attack what you wish to defend. Franklin Roosevelt was not "fixated" on militaristic fascism... but he spent quite a bit of his efforts and energy fighting it, because militaristic fascists were attacking the country that he, as president, was sworn to defend. Today it is pro-abortionists, pro-homosexuals, and certain varieties of feminists that are attacking the Traditions of the Orthodox Church. We didn't pick them, they picked us. We have no choice but to defend the Church and its Tradition, or to raise the rainbow flag and surrender. We do believe that the Orthodox Church is the True Church, and that the gates of hell will not prevail against it, but that does not mean that large parts of it, including our own, cannot fall into heresy and error, if we are not vigilant. It has happened more than once in Church history, and there is no reason to think that we are somehow immune today. The people of God are the guardians of piety, as the Encyclical of the Eastern Patriarchs of 1848 (in reply to Pope Pius the IX) states. It is therefore not only permissible, but obligatory for all of the faithful, and even more so for the clergy, to oppose these attempts to infect our Church with the same heresies that have wreaked such havoc in mainline Protestant Churches, and are in the process of doing the same in the Roman Catholic Church. Question: "Christ gave a parable about the Pharisee and how he fasts twice a week (Luke 18:12). Why did the Orthodox adopt things Christ condemned in Scripture?" Nowhere in that passage does it suggest that Christ condemned the Pharisee because he fasted twice a week. What is condemned is his boasting, and his judging himself to be better than the publican. In Matthew 23:23, Christ said: "Woe unto you, scribes and Pharisees, hypocrites! for ye pay tithe of mint and anise and cummin, and have omitted the weightier matters of the law, judgment, mercy, and faith: these ought ye to have done, and not to leave the other undone." Note that while Christ clearly indicates that tithing the mint, anise, and cummin was of lesser importance than the weightier matters of the law, He nevertheless says that they should have done the former without omitting the latter... not that they should have blown off the tithing of these things. 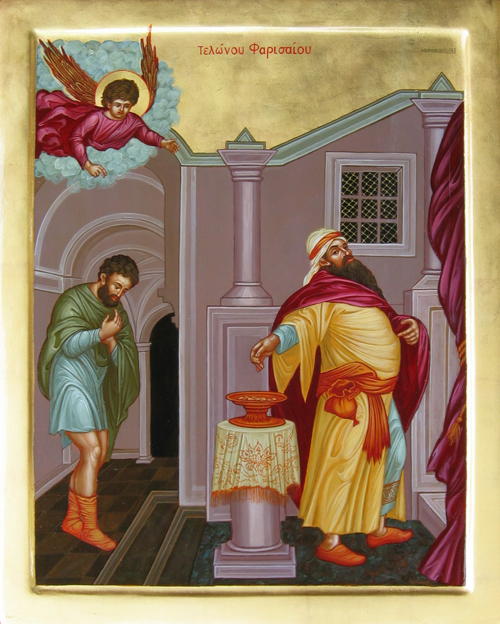 "Let us make haste to follow the Pharisee in his virtues and to emulate the Publican in his humility, and let us hate what is wrong in each of them: foolish pride and the defilement of transgressions" (Lenten Triodion, Sunday of the Publican and Pharisee, Canon at Matins, Ode 5, first troparion). In Matthew 9:14, were are told that St. John the Baptists disciples asked Christ: "Why do we and the Pharisees fast oft, but thy disciples fast not?" Christ did not use this occasion to denounce fasting. He instead explained why His disciples were not fasting at that time, by asking them the question: "Can the children of the bridechamber mourn, as long as the bridegroom is with them?" But he went on to say: "...but the days will come, when the bridegroom shall be taken from them, and then shall they fast." And so ever since the time of Christ's ascension into heaven fasting has been an important part of the Church's life. Fasting on Wednesday and Friday is apostolic in origin. It is recording in the Didache (8:1), which was a first century record of Apostolic Teaching. "If any Bishop, or Presbyter, or Deacon, or Subdeacon, or Reader, or Chanter fails to fast throughout the forty days of Holy Lent, or on Wednesday, or on Friday, let him be deposed from office. Unless he has been prevented from doing so by reason of bodily illness. If, on the other hand, a layman fail to do so, let him be excommunicated." So clearly fasting is important, but it is important as a spiritual discipline, and is a means to an end -- not an end in itself. It teaches us to say "no" to our desires, which is a skill that comes in handy throughout our life. It is also a matter of obedience to the Church, and of entering into periods of fervent prayer with the whole Church. However, if we fast, but allow ourselves to fall into pride over it, our fasting is of no benefit. But the cure to that ailment is to humble ourselves, not to give up fasting. Indeed "Let us make haste to follow the Pharisee in his virtues and to emulate the Publican in his humility, and let us hate what is wrong in each of them: foolish pride and the defilement of transgressions"